There [in Nazareth] the child [Jesus] grew up healthy and strong. He was filled with wisdom, and God’s favor was on him. Unspecified in the Bible narrative. This scene takes place in the day time. This scene is set in Joseph’s workshop. This is one of the few scenes mentioned in the Bible that portrays Jesus’ childhood. 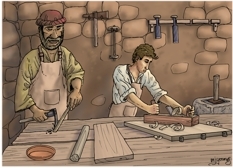 In this scene we can see Joseph on the left and the young Jesus on the right; both are working in the family workshop. We are told in Luke chp 1  that Joseph was betrothed (engaged to be married) to Mary, who was the mother of Jesus. Although Joseph’s profession is not mentioned in Luke’s Gospel, both Matthew and Mark make oblique mention that Joseph was a carpenter (see footnote  and  below). The Greek work which we have translated “carpenter” is τέκτων (pron. téktōn) which is rather more than a worker in wood. Téktōn could be more accurately translated artisan, craftsman, master craftsman, or builder. It is possible that Joseph worked in stone (ie a stone mason) rather more than he did in wood, since stone was readily available in 1st century Israel, and wood was rather more scarce. 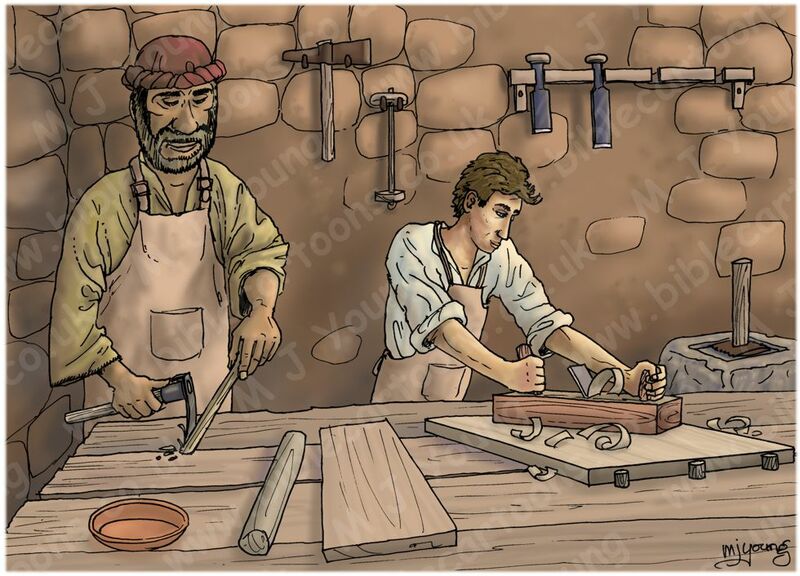 I expect Joseph was capable of working in wood, stone and other materials, and was employed to build houses, wine presses, watch towers, etc, but was also engaged to produce furniture, doors, wooden items, etc, when necessary. In my scene, I have shown Jesus using a long plane, to work a piece of wood, flattening and smoothing off its rough edges.